Microsoft PowerPoint is one of the most powerful presentation tools on the market. However, it lacks customizable tools to help win over your audience. Without customizable tools, you’ll be at risk of pesky bouncing icons or embarrassing push notifications. 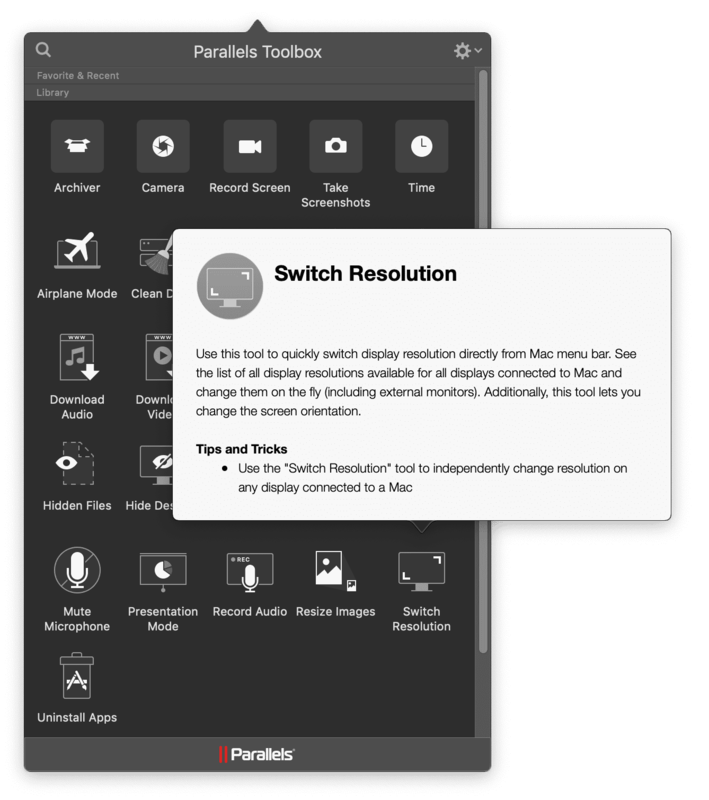 Here at Parallels, we like to think that everyone would benefit from our suite of one-click tools, Parallels® Toolbox. 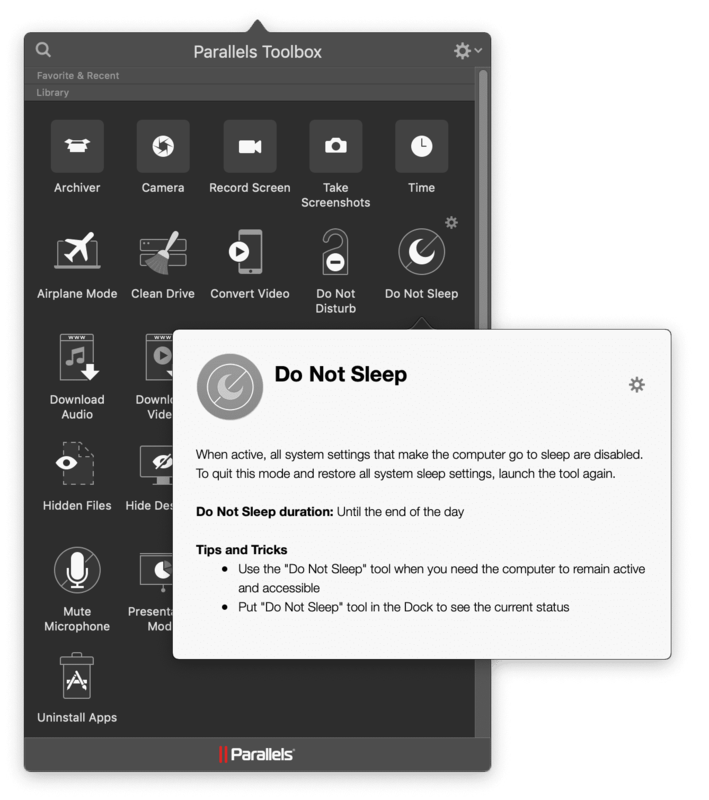 Parallels Toolbox provides a wide array of one-click tools that help narrow your focus on creativity, productivity, and easily managing your system. 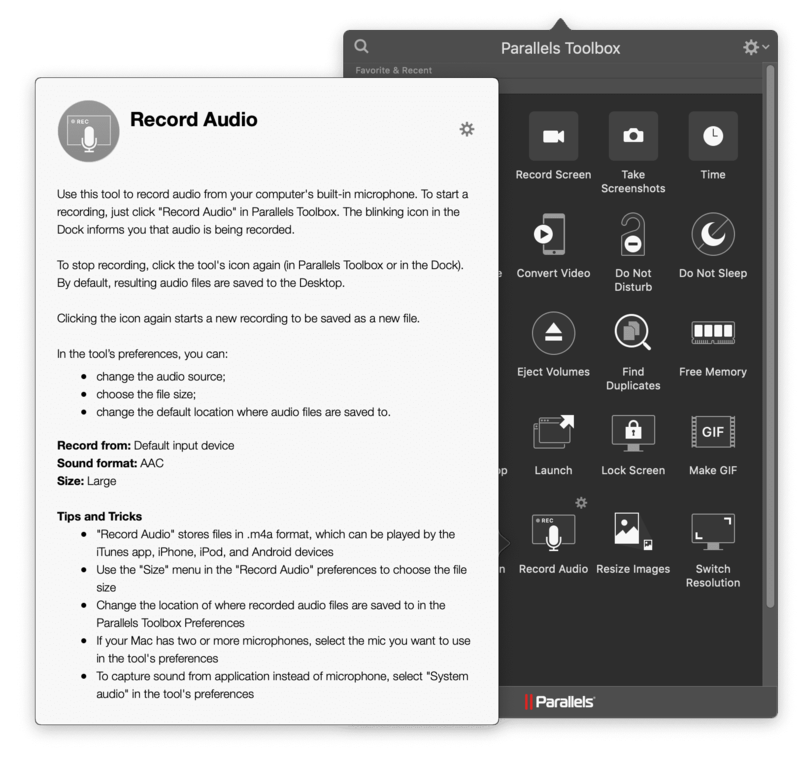 While there are plenty of individual applications that assist with presentations, Parallels Toolbox is set above the rest because it’s one application that includes over 30 tools. Other competitors have averaged $9.99 to $29.99 per application—Parallels Toolbox is available for one low cost, $19.99 per year. 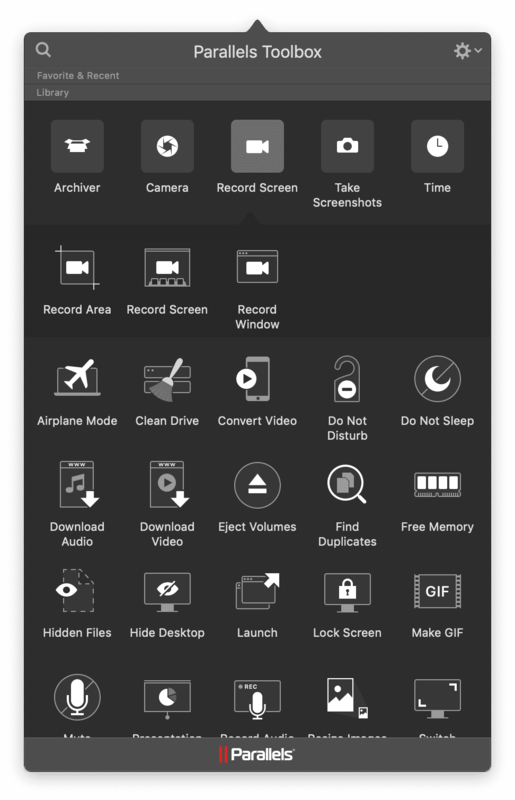 Easily use this tool to record video of your entire screen. When activated, click anywhere to start recording. 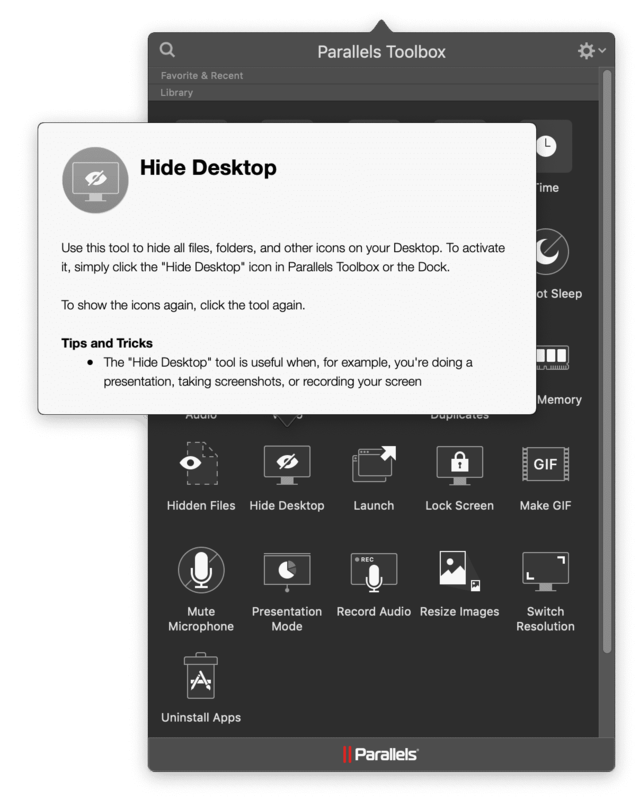 If your Mac® has more than one display, click the display you want to record from. While recording video, this tool also records audio from your computer’s microphone. To stop recording, click the icon in the macOS® Dock. This is easily my favorite tool bundled in Parallels Toolbox. 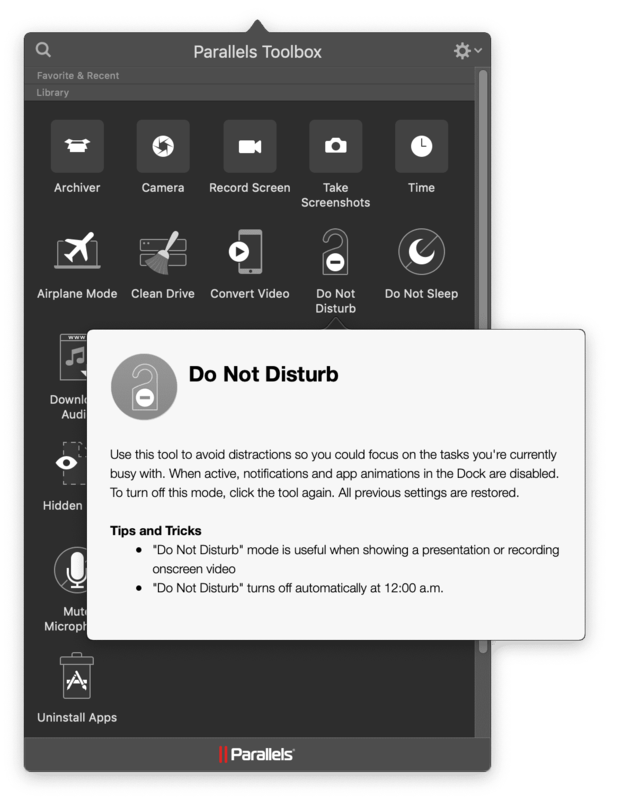 Do Not Disturb enables users to stop all incoming distractions to narrow focus. Prevent your computer from going to sleep and your display from dimming. Hide all the files, folders, and other icons on your desktop. Use your computer’s built-in microphone and record audio with a single click. You can record from an external microphone if it’s selected as the input source in System Preferences › Sound. Quickly switch the screen resolution. Disable distractions for a better presentation experience. Presentation Mode can automatically detect external displays and turn itself on. 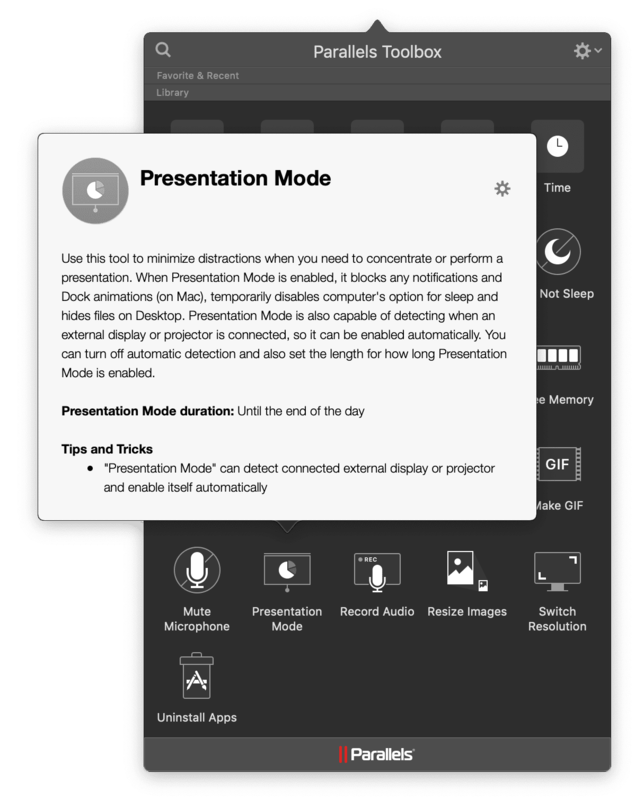 The Presentation Mode tool is a combination of Do Not Disturb and Do Not Sleep, and it helps optimize the display for presentations. PowerPoint, Google Slides, and Keynote can be used to deliver excellent presentations. But Parallels Toolbox helps you break the conventional presentation practices and optimize your computer to be presentation-ready—in just one click. Are you looking to download Parallels Toolbox and try it free for 7 days prior to deciding if you’d like to buy it? No worries, download it for macOS or Windows!